The metal recycling industry has become one of the biggest and most advanced industries in the world because it is now far more cost effective to produce products from scrap metal than from virgin metals. The large increase in metals recycling has led to extensive savings in natural resources including 74% conserved water, 86% reduction in air pollution, and 90% conservation in natural resources. 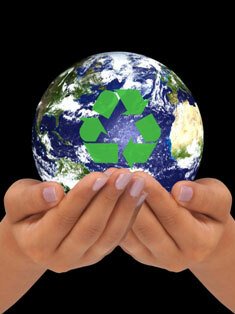 There is no need to deplete the resources of the Earth when it is so simple and easy to recycle existing metal. The biggest advantage related to recycling metal is the fact that it can be recycled over and over again without losing any of its original properties. This makes metal an extremely valuable commodity. When the product in which the metal was used reaches the end of its usefulness the metal can be scrapped and recycled to make an entirely new product. Our horse fencing products are made from the two most commonly recycled metals – steel and aluminum, both of which contain no poisonous or unsafe components and are found naturally in the Earth. The powder coated finishes on our horse fencing products are also environmentally friendly as powder coatings emit zero volatile organic compounds (VOC) and powder coating overspray can be recycled. When you buy our horse fencing products, you can feel good about buying a quality horse fence that is a 100% recyclable, environmentally friendly metal product. When your Buckley Fence reaches the end of its long and useful life, it will not end up in a landfill. Rather, it will remain a valuable commodity as scrap metal to be recycled into a completely new product without depleting the Earth’s resources. It takes a lot less energy to melt down waste metal and recycle it than it does to produce new metal. Using recycled metal reduces CO2 emissions and air pollution. Less water is used and less water is polluted. Reduces the need to mine the raw materials required to make the metal. Reduces the amount of metal going to landfill. Make a beneficial contribution to the environment. Buy our horse fence today! Call toll free 877-306-4024. Copyright © 2019 Buckley Fence, LLC. All Rights Reserved.